Variations will help you create diversity for your products. Having different versions of the same product will attract more clients that wouldn’t settle for the product in its original state. It is easy to add variations in WP eCommerce and we will show you how to do it in this tutorial. 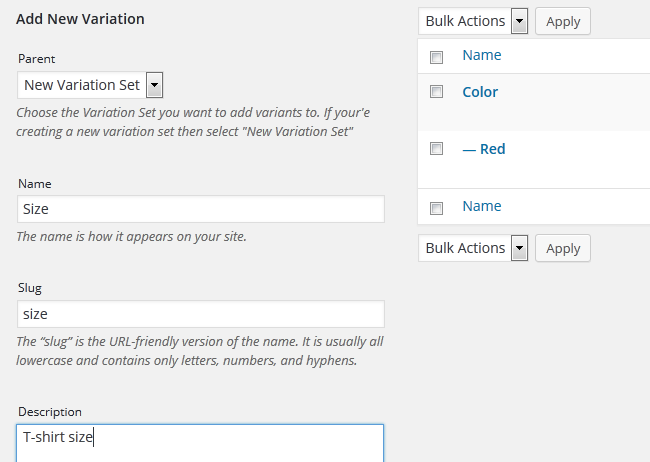 We will start, by navigating to Products>Variations, from the WordPress main admin panel. In this page you will be able to view your existing variations and add new ones. Let us add a variation Named Size which we will use for t-shirt sizing. The variation Price field is for the cases you have additional expenses making this variation of a product and you want to set up an extra price for it. 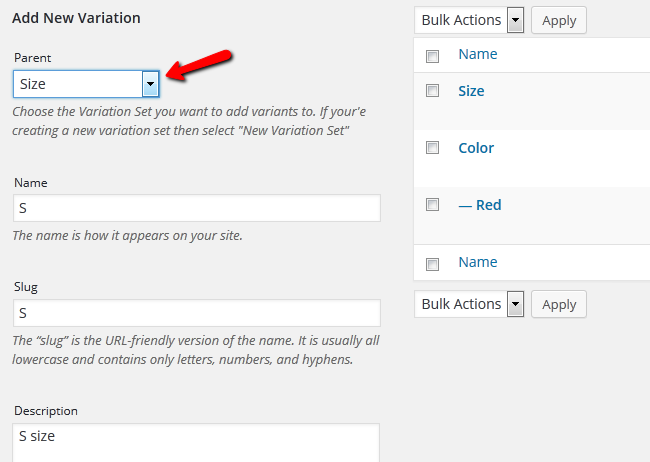 You can also do that when adding a product during the step where you choose the product’s variation. In our case we will leave this field empty. Click on the Add New Variation button to complete the variation creation. Now if you want to add different sizes as children to this variation you can do so by creating them and using the variation Size as Parent. Hit the Add New Variation button and now you have a Size S variation. On the right you can see the variations, their descriptions, slugs and how many items currently have been set to use set variations. Here you can also see the newly created Size variation and his child S variation. For more information on how to set a variation when creating a product visit our Add Product tutorial.